Premium acrylic cell phone displays at low wholesale prices. 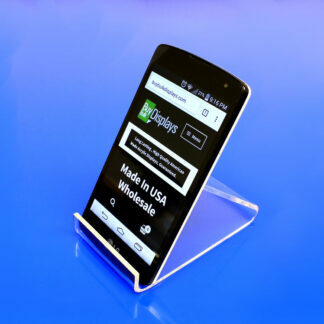 We manufacture 6 different styles of acrylic cell phone displays available for smart or flip phones. Manufactured out of premium grade and flame polished acrylic. Unlike competing imported acrylic cell phone displays, our cell phone displays are made from 100% prime grade, non-reprocessed acrylic, giving the acrylic displays a higher clarity.